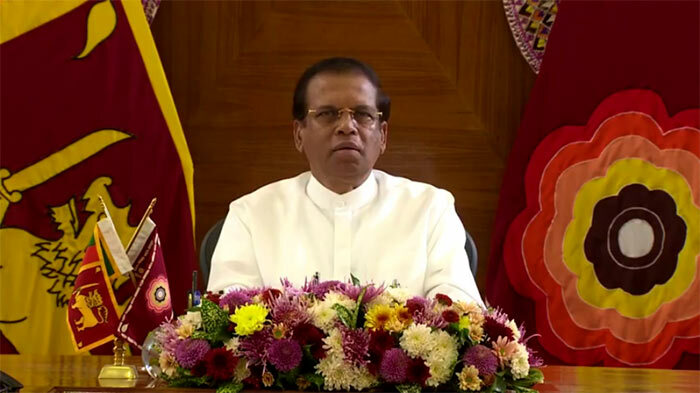 President Maithripala Sirisena has called a conference with the participation of all political parties represented in the Parliament, with the aim of bringing an end to the political crisis in Sri Lanka, Presidential Media Division said. It said that the all-party conference will be held at the Presidential Secretariat in Colombo at 5.00 p.m. today (18). The PMD also said that Speaker Karu Jayasuriya has also been invited for the conference. When the parliament is dissolved how come president is still in power. Doesnt he also belong in the parliament? President is playing games here. When he came to power why didn’t he take any action on Rajapakse for crimes and corruption he committed. How much public wealth have been stolen. Maithri knows all those and not only that human crimes and ethnic cleansing Rajapakse did. Entire world knows this. But Maithri still supports the criminal. If he is genuine guy, by now Rajapakse would be in UNHCR shell. Where are reports that were required by the UNHCR commission. Maithri just lied infront of international community at The UN headquarters about reconciliation process.,nothing has been done. Still the minority ppl getting torchered and getting abused. Why didn’t the president allow the international justice committee to come and investigate the crimes committed by Rajapakse and his gang. He wants Raja to be prime minister so both can get together and commit more crimes and corruptions. Oh lord save innocent people and the nation from the hands of these crimeinals. The IMF has suspended all credit facilities. We will not only be unable to pay the debt but unable to pay for essential items including fuel. Our own Mugabe is following the footsteps of the original Mugabe. The so-called All Party Conference ended inconclusively. This man is extremely arrogant and is saying that he is the only all-powerful on earth. The general population of the country is suffering because of this man’s arrogance; his hunger for more power cannot be satisfied. This man was speaking about Mandela a month ago at the UN. What a shame. An impeachment motion against him be taken up in Parliament.